What does a humanities graduate student do for summer work in this economy? “Not much” is the punch line most are looking for, but I have had a few rewarding opportunities for which I am grateful. There is still some room on my schedule for some others, if you know of any! Some of my usual work was not available – I have served as faculty or field staff for the Vicar for Clergy, the Faith Formation, Liturgy, and Youth & Young Adult Ministry offices in the past, but several budgets have been cut, and other classes were booked as early as January, and I only started looking in February! I will be teaching two courses on the Eucharist for our Liturgy Ministers Institute, and working with a couple parishes on leadership development and reorganizational processes, but the most interesting offer was a 10-hour course for the Archdiocese of New Orleans’ Institute for Catechetics and Spirituality, which I taught this week. “An Introduction to Ecumenism and Interreligious Dialogue” – ten hours is nowhere near enough, but sadly more than most in ministry get! The Big Easy was hot and humid, but a year and Rome had prepared me. I was only stateside for a few days and just about recovered from jetlag when I left back across the country on a flight almost as long as the one that brought me home from the Netherlands – a reminder that Euclidean geometry does not apply when making flight plans! My host for the week was a friend and fellow ecumenist/lay ecclesial minister, Buddy Noel. My first moments in New Orleans provided an opportunity for prayer. On his way to the airport to pick me up, Buddy was caught in one of the South’s infamous downpours, and his car hydroplaned into the one in front of him in a backup on the Interstate. At least 12 cars were involved in a number of different collisions in the same area at the same time. His car totaled, Buddy was able to walk away with only bruises from the seatbelt and airbag. As he was making calls from the side of the road, his phone died. Long story short, he got a ride to the airport and had to have them page me, just a couple hours after his accident. I have been given great hospitality before, but this takes things to the extreme! With a small group for the class, I was able to tailor much of it to some of the questions and expectations of the students, who were a mix of parochial school teachers, parish staff, and interested lay people. And nothing reinforces one’s own studies like teaching a topic, especially when you have to distill the highlights of a dozen years of study into a few hours. It also gave me plenty of time to talk with people and find out a little about the state of the church in one of the Catholic culture centers of the U.S. It was also only my second time to New Orleans, the last being just before Katrina; this time, they were just fitting the well with the new device to see if they could finally stop the largest oil disaster in history. 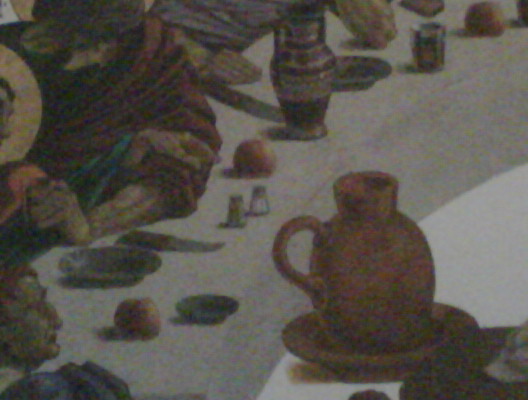 Last Supper (detail): Salt and pepper shakers, eh? Archbishop Gregory Aymond has been the Ordinary there for just about a year, the first native of the diocese to serve as its bishop. Everyone I spoke with was positive about his appointment, with sentiments ranging from pride for a home-town boy done well to enthusiasm for his ecclesiology – and apropos to my visit – his commitment to local ecumenism. The city has recovered its population and most of its infrastructure from Katrina, which hit nearly five years ago, but there have been changes. The Lower Ninth Ward looked like a field with a few funky, new houses scattered throughout – you would never know it had been a crowded urban neighborhood until the storm surge. There were still signs of the Katrina, a few gutted and abandoned houses throughout the city, a few roads sinking into the silt, but these were the exception rather than the rule. 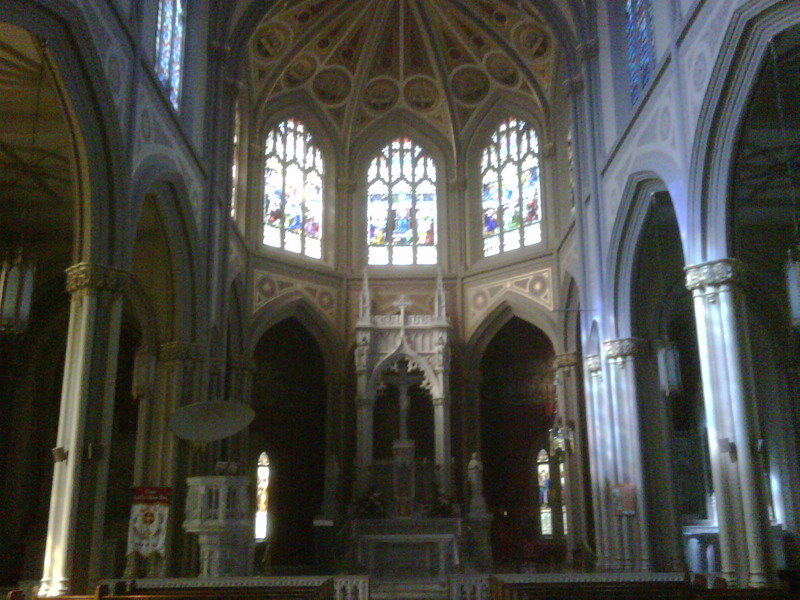 One of my students had been involved in a Chinese Catholic community that had been fairly active before the storm, whose members are now in diaspora around the country; A similar story with some of the small Eastern Catholic parishes in the diocese. Several people have simply moved to the other side of Lake Pontchartrain. 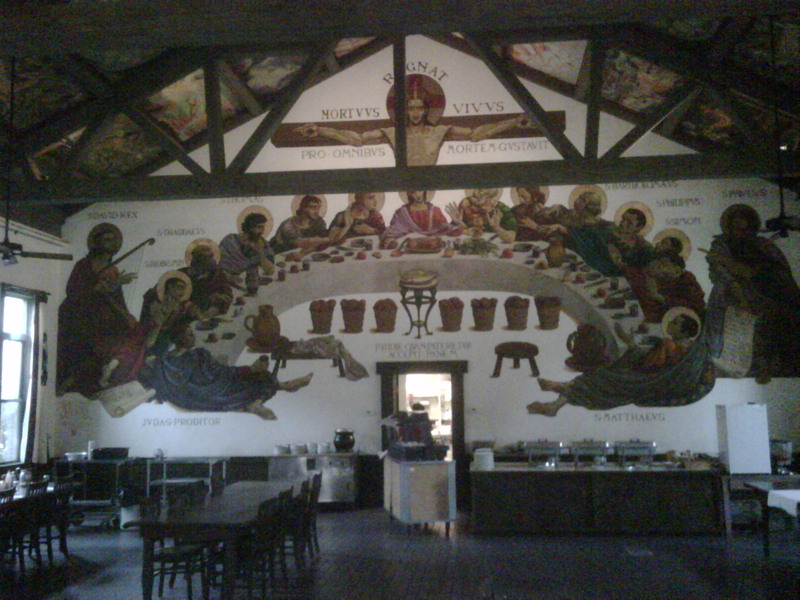 The hospitality was generous and the food was excellent; the company was both! I was blessed to talk with new people each night, sample my first Po’Boys and some Gulf Coast seafood (sans oil), and wander the French Quarter, complete with obligatory beignet and Café au Lait. We prayed evening prayer with the Benedictines at St. Joseph Abbey, and I rode across the longest bridge in the world. Imagine driving onto a bridge and not being able to see land at the far side! 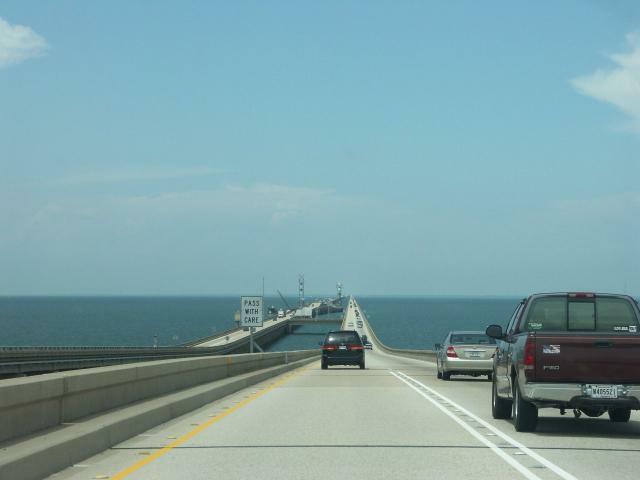 The Lake Pontchartrain Causeway is about 24 miles (38.5km) from one shore to the other. 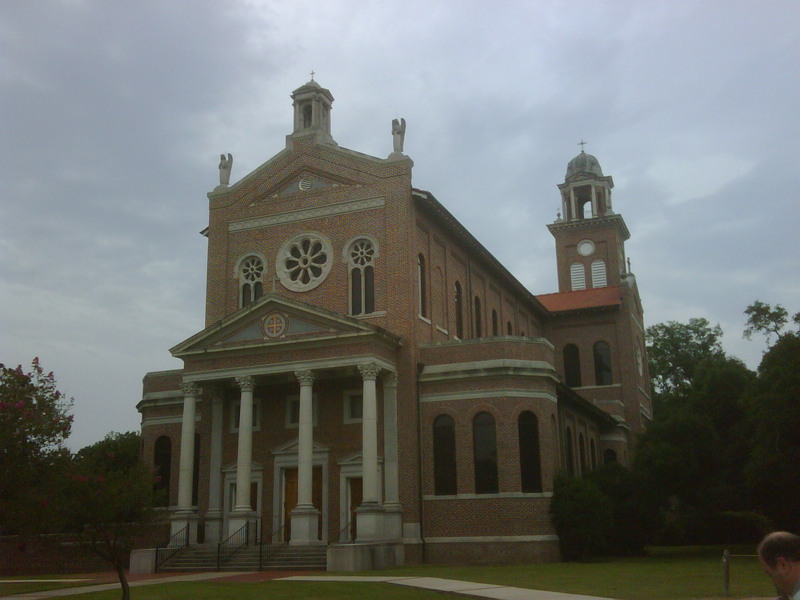 One little tidbit I picked up that fellow pastors and pastoral workers would find interesting, as well as the discussions around parish closings and reconfigurations after Katrina, was the relationship of parish and parochial school. Unlike the northwest, where a fractional minority of Catholic students attend Catholic schools, most in New Orleans do so. The relationship is a little better developed in some respects, as well – for example, the parish Director of Religious Education oversees the curriculum and instruction in both the parish religious education and youth ministry programs as well as the parish school classrooms. By A.J. 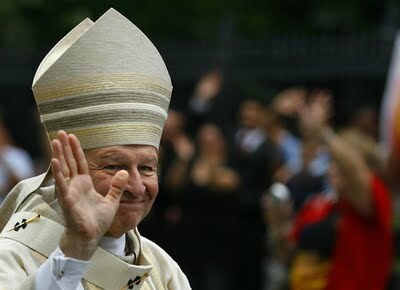 Boyd in Church and World, Theology and Ecumenism on July 18, 2010 .
please keep it up. i read your articles and i am happy and delighted to learn that you are really doing what God wants you to do. please keep it up. i hope to hear from you soon. Have a wonderful day ahead. NOTE: PLEASE PRAY FOR MY SUCCESS IN MY DAILY ACTIVITIES.